On Monday, September 23rd, the United Nations General Assembly held a High-Level Meeting on Disability and Development (HLMDD) driven by the theme, “The way forward: a disability inclusive development agenda towards 2015 and beyond”. As a precursor to the start of the general debate at the UN Headquarters in New York, the meeting proved historic as it became the first meeting in UN history where the rights of persons with disabilities have been discussed in terms of the framework of the UN’s political agenda. The monumental establishment of such a meeting presents a significant opportunity to translate the commitment to an inclusive global society into tangible actions, on the ground changes, and concrete achievements by ensuring that disability becomes mainstream in the global agenda in the post-2015 development framework. The UN’s Millennium Development Goals are the foundation for the blueprint agreed upon by the world’s countries and leading development institutions to address the greatest needs of the world’s poorest people. Although these goals range from cutting extreme poverty in half to halting the spread of HIV/AIDS and even to providing universal primary education, these goals failed to include persons with disabilities in the past. The estimated one billion people worldwide who live with disabilities therefore experience high rates of poverty and are largely excluded from access to resources like education, healthcare, and employment. The issues we advocate for at NCIL and within the disability advocacy community in the United States as a whole extend beyond our borders, making disability advocacy a truly global mission. Although the UN can be commended for bringing to attention the needs of the disability community with the adoption of the 2006 Convention on the Rights of Persons with Disabilities (CRPD), disability remains almost entirely invisible in mainstream development processes across the world. In an effort to give the disability community the recognition that it requires, there is hope that the UN will directly include disability in the next set of development goals, made clear by the establishment of September’s High-Level Meeting. Participants of the meeting included ambassadors from a wide range of countries, representatives of the UN, and the voices of civil society coming from different disability organizations, NGOs, and the private sector. Organizations like the International Disability Alliance and the International Disability and Development Consortium consistently advocate on behalf of such disability inclusive development agendas to ensure the establishment of the human rights of people with disabilities across the world, and were active participants throughout the entire meeting. Speakers included the UN Secretary-General Ban Ki-moon, President of the General Assembly John Ashe, Chair of the Committee on the Rights and Participation of Persons with Disabilities Maria Soledad Cisternas Reyes, and Stevie Wonder. Meeting participants expressed their recognition that there is much work to be done in the developing world. Accessible curbs are taboo in the many underdeveloped parts of the world. It is for this reason that advocates are more passionate than ever to prove how members of the international disability community are productive members of society by continuing to cultivate a rights-based approach fueled by models of Independent Living. Take a moment to view a short video put together by the UN as a recap of the diverse faces of the meetings and their thoughts on its successes. The meeting concluded with an action-oriented outcome document intended for providing policy guidance and reinforcing international efforts to ensure accessibility and inclusion of people with disabilities in development efforts. The document addresses many of the aforementioned concerns and is complete with a follow-up action plan and a boost for the CRPD. The UN’s affirmation of the importance of a disability-inclusive development agenda sheds light on the importance of the rights of people with disabilities everywhere, thus generating awareness for the CRPD. In our dedication to international disability rights at the UN, we must continue to fight for the ratification of the CRPD by garnering awareness for the legislation that embraces the dignity of all people with disabilities. 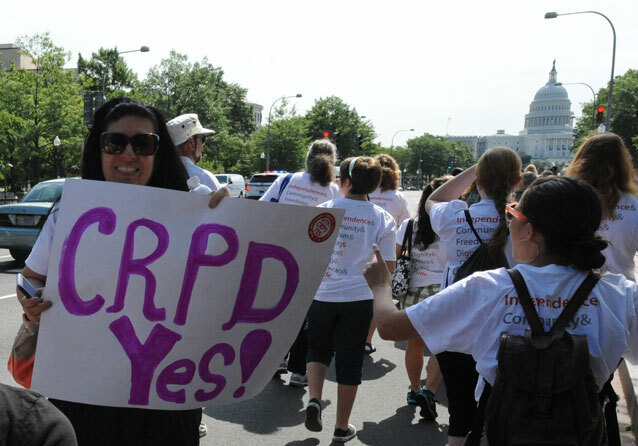 The CRPD was modeled after the values of independence, respect, and accommodation cemented by the ADA, thus making the United States one of the leaders of disability rights. The CRPD and the ADA therefore both demonstrate similar philosophies in the nature of disability rights. Although the CRPD has been ratified by more than 100 countries, the U.S. Senate failed to ratify the treaty in December 2012, by only a few votes. We must continue to advocate for the ratification of the treaty to ensure respect and independence, non-discrimination, and effective inclusion in society. Take this opportunity, fueled by the UN’s efforts, to advocate!